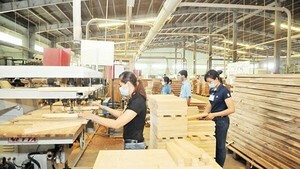 Vietnam’s public debt is expected to account for 61.1 percent of Gross Domestic Product (GDP) in 2018, which is within the allowable limit by the National Assembly and lower than expected in mid-term financial plan, according to the leader of the Department of Debt Management and External Finance under the Ministry of Finance. In 2018, the agency has consulted the ministry's leaders on improving policies, legal documents guiding the Public Debt Management Law and instructions related to negotiation and conclusion of agreements on official development assistance (ODA) and foreign preferential loans. So far, the department has presided over negotiating and signing of 14 ODA and foreign preferential loan agreements with the total value of US$1.25 billion. Foreign debt payment has been made by the Government sufficiently on schedule and in a timely manner with the total value of VND42,850 billion ($1.84 billion).